Your guests will go crackers for these adorable wedding favours. Affordable and easy to make. 1. Download the "Thank You" template below and cut out. 2. Cut the toilet roll inner to the size you need and cover with crinkle paper. 3. Use Bostik Double-Sided Tape to seal the edges of the crinkle paper in thecentre of the toilet roll. 4. 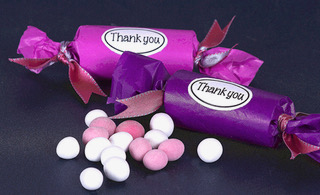 Seal one end using a ribbon and fill with sweets before sealing the other end. 5. Using a Bostik Glue Stick, stick on a Thank You cut out.